That's one of my favorite quotes from Epictetus, a slave, and philosopher in Ancient Greece. It certainly means different things to different people. However, let me offer something pertinent to this journal. If what you say to yourself is that you would be a writer, it follows that what you have to do is write, and write a lot. If you wish to be a professional writer, what you have to do is write, and write a lot! All of us have written. Heck, if you text you’re a writer. (If you haven’t done so, consider reading “Everybody Writes” by Ann Handley. I love it!) What I’m betting is that you want to be a successful professional writer, perhaps defining "successful" as famous, recorded, published, heavily compensated, or award-winning. Here’s the thing, the only difference between a professional writer and an amateur writer is that the professional gets paid for what she does. Even more likely, our theoretical professional is only potentially paid for what she writes, with no guarantees. Does she write more skillfully than the amateur? Perhaps. But not necessarily. And take heart, every professional writer began as an amateur. Are You Already A Professional? Start this very moment with the next keystroke, thumb touch, pencil movement, whatever, to write like you’re already a professional. Because, you know that song you just wrote, the novel you’re penning, the screenplay you just submitted? If one of them is successful enough to generate money in the future, it will have been written by you, the professional writer, while you were technically still an amateur writer. Write as if you’re already being paid to do so. Write that well. Write that much. Write that way, right now. Worry less about getting your songs heard and more about writing excellently. That is the path to having a career as a professional writer. In the case of a songwriter, being able to deliver excellence consistently is paramount. I’m not saying every song you write has to be a hit. No matter how good you are, that doesn’t happen. But you must be able to deliver the goods. If you ever do have the immense good fortune to have one of your compositions recorded and released (And I hope you do! ), I pray for your sake that it is not the only “hit” material you’ve penned. Why? Because the gatekeepers and decision makers of the moment will turn to you and ask, “Okay, what else have you got?” If you don’t have an answer of sufficient quality at that moment, the odds are high that they won’t ask again. Insights like these can feel to us like pieces of an immense puzzle whose image remains partially or even entirely obscured as we’re assembling it. Let that be okay, and keep working on the puzzle! It doesn’t put itself together. It never puts itself together. You’ve heard that before haven’t you. We have to do the work, sometimes in the dark. First, say what you would be... Songwriter? Author? Screenwriter? Then, do what you have to do. Write, write, write! But wait, there’s more. What if I mess up the puzzle by saying, “Writing isn’t the most important part of writing.”? Would you stay with me? I hope so. Next time, I'll explain the paradox. In the meantime, consider practicing what Epictetus and I have suggested. Are you wondering where the horses are? They ran right through the middle of this. I just didn’t point them out. I will in my next entry. Have you guessed the title? 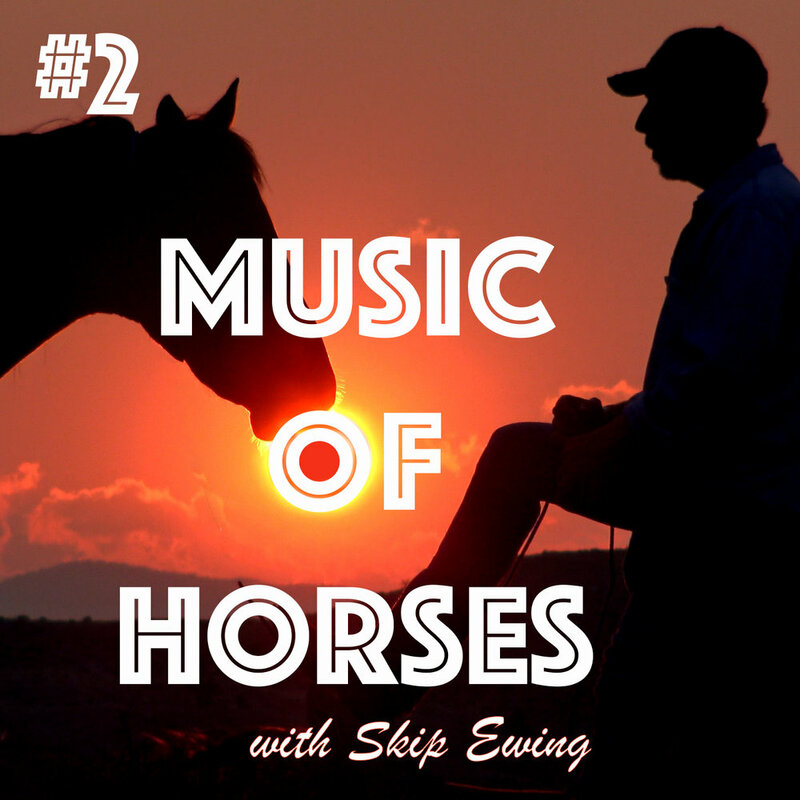 Skip Ewing is an award-winning singer, songwriter, recording artist, and horseman with 300 major artist recordings and compositions contributing to the sale of 80 Million albums. His accolades include BMI Songwriter of the Year, NSAI Song of the Year, CMA Triple Play Award (3 #1 songs in a 12 month period), 14 BMI Million-Air awards and 25 chart hits. He lives in Dubois, WY with the love of his life, their dog Jack, and their three horses: Aramis, Tammi, and Toby. Visit SkipEwing.com for more information. Enjoying Skip’s journal and podcast entries? Please share!